In August and September, Marrugeku’s award winning production Gudirr Gudirr toured remote communities of the Kimberley and regional venues of NSW, finishing off with a performance in Canberra! 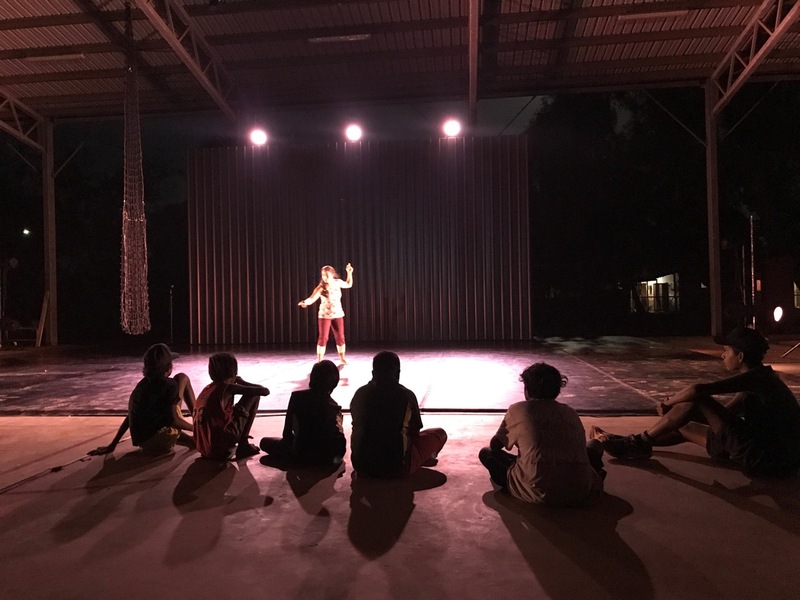 Marrugeku are committed to sharing our productions with remote and regional communities to invest in building audiences for contemporary dance and storytelling. Gudirr Gudirr continues to be well received since its 2013 premiere. Concepts and concerns explored within the work seem all too familiar in our current affairs, continuing to touch audiences locally and globally. Gudirr Gudirr calls a warning, the guwayi bird calls when the tide is turning — to miss the call is to drown. An intimate solo dance and video work performed by Dalisa Pigram, daughter of Broome. By turns hesitant, restless, resilient and angry, Gudirr Gudirr lights a path from a broken past through a fragile present and on to a future still in the making. The production considers the legacy of Australia’s history for Aboriginal people in northwest Australia today and asks: what does it take to decolonise Aboriginal people’s minds, to unlock doors and to face cultural change? Gudirr Gudirr calls a warning to a community facing massive industrialisation on traditional lands, loss of language and major gaps between Indigenous and non-Indigenous wellbeing. Drawing on a physicality born of Pigram’s Asian–Indigenous identity, and in a unique collaboration with Belgian choreographer Koen Augustijnen and visual artist Vernon Ah Kee, Pigram builds a dance language to capture this moment in time for her people.